Made of high quality stainless steel & polished to a near mirror finish. 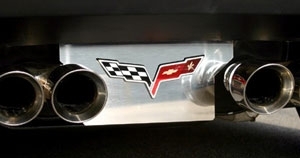 This inexpensive but high quality exhaust plate will enhance the look of the rear of your C6 Corvette. Comes with C6 emblem. Will not fit 2008-2013 NPP exhaust quipped cars.